You can click on any of the images below to see a larger version of it. 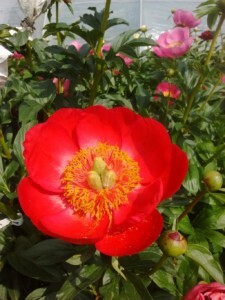 The fernleaf peony (Paeonia tenuifolia) is well known and widely appreciated and will need no further introduction here. 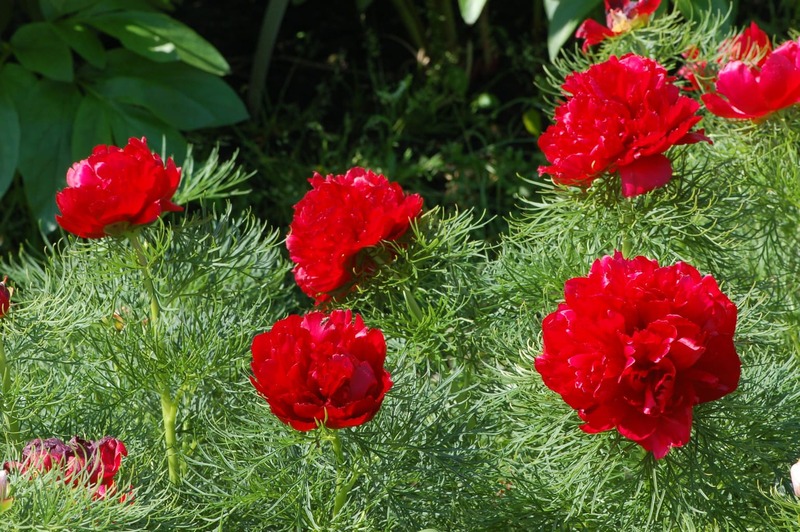 In addition to plants with single red flowers, typical of the species, a double red (var. 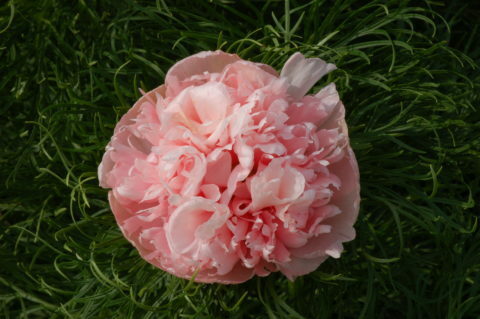 ‘Plena’) and a single pink form (var. ‘Rosea’) exist. Hereafter in this article, the mentioning of these variety names will always refer to the pink or double clones presently offered in commerce. Rumors about white singles and pink doubles have been confirmed not long since. 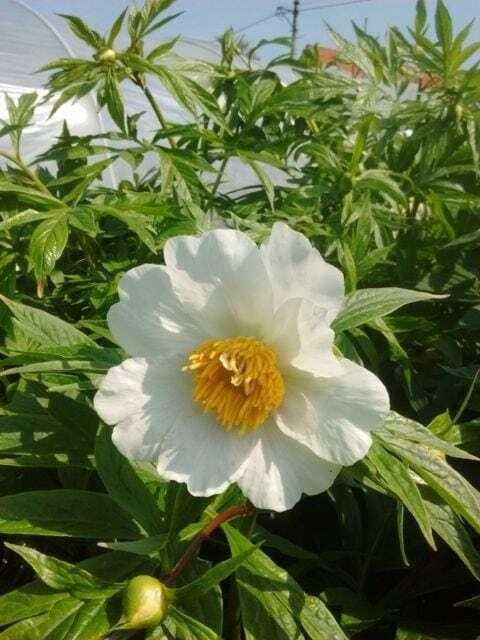 Recently, the pure white selection ‘Weisse Perle’ (Giessler 2013), with first bloom in 2009, was registered with the American Peony Society. In 2010, Leo Smit of Canada found a double pink fernleaf among his plants grown from seeds, which he had purchased in England. 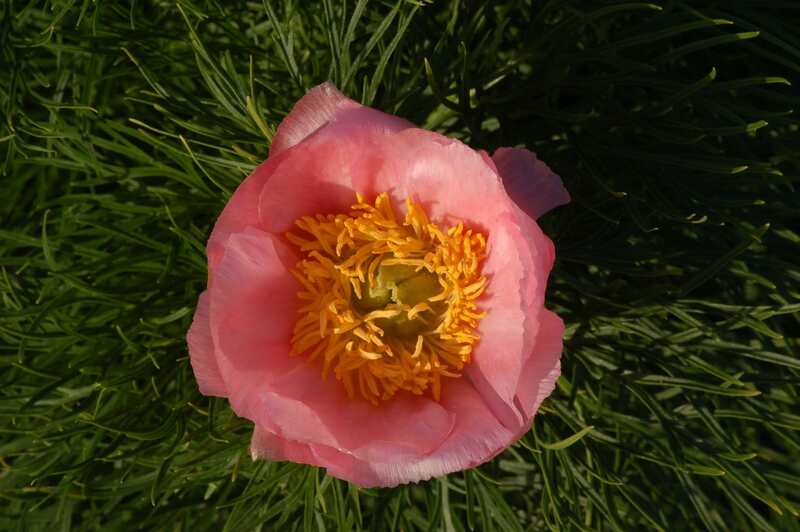 This story is told on the website of the Heartland Peony Society. Significant advancements in fernleaf peonies seem to be underway. In the 1980’s I purchased the red double and the pink single from Heinz Klose (now deceased) of Lohfelden, Germany. I have never had any other P. tenuifolia in my garden than just these two plants and their progeny. Around 1990, I pollinated var. ‘Plena’ with var. ‘Rosea’, just to toy with them I guess. All the resulting plants bloomed single and red. Disappointing perhaps, but soon I had other problems. We had to move our garden to another location and at the end there were only two seedlings left of that cross (TF-1 and TF-2). But I had learned by then that my result was typical for dominant-recessive inheritance. Basic genetics teaches us that genetic information in plant cells comes in duplicate. A homozygous plant with single flowers has the gene S in twofold at the pertinent chromosomal location (SS). A double form has dd there instead. One gene from each of the parents is passed on to their offspring. Thus, when a single is crossed with a double, all seedlings will have the genetic configuration Sd. Such plants are called heterozygous. If the inheritance pattern is dominant-recessive and S is dominant, the flower will be single. When two such heterozygous plants are intercrossed, there are several possibilities for the genes to recombine: Sd x Sd may give SS, Sd, dS or dd. All outcomes of combinations will have equal probability. Sd is the same as dS, so we get 25 % SS (single), 50 % Sd (single) and 25 % dd (double). In the pink single tenuifolia, the genes pp for pink will be present instead of RR for red at the location where color is determined (with R being dominant). If a red double is crossed with a pink single, two mechanisms of heredity run simultaneously and independently: ddRR x SSpp inevitably gives 100 % SdRp, meaning 100 % single red flowers. In the second generation (F2), we get a diversity of combinations: SdRp x SdRp gives 6.25 % SSRR (single red), 12.5 % SSRp (single red), 6.25 SSpp (single pink), 12.5 % SdRR (single red), 25 % SdRp (single red), 12.5 % Sdpp (single pink), 6.25 % ddRR (double red), 12.5 % ddRp (double red) and finally 6.25 % ddpp (double pink). Thus, a pink double may come from crossing two red singles! I got my first F2 seedlings shortly after the turn of the millennium, but luck wasn’t on their side. Few of them reached maturity, because of neglect due to the sheer lack of time which I constantly suffered back then. Anyway, I found a double red (TF-4) and two single pinks (TF-6, TF-7) among these F2 plants and this confirmed my underlying assumption. A batch of seeds planted in 2005 met a better fate. Flowering began in 2011 with two pink singles (undistinguishable from var. ‘Rosea’) and five or six red singles out of approximately 60 seedlings. This was not disappointing, since I wouldn’t count on doubles among the first 10 or 15 percent of first blooms in any batch of seedlings from which 25 percent can be expected to be double. I think it is common for singles to show up first. In the following year (2012), two nice pink doubles appeared (TF-8 [now registered as Little Erna, ed. ], TF-9). A third one joined the group in 2013 (TF-10, [registered as Aunt Fritzi, ed.]). Most of the seedlings of 2005 have flowered now. Next to the pink doubles, there are about 10 pink singles and 10 red doubles as well as some 30 single reds. This corresponds very nicely with the earlier lesson in basic genetics. In 2012, TF-8 and TF-9 showed one and two flowers, respectively. Both were transplanted in the following fall since they stood rather crowded in their bed. In 2013, the respective numbers were six and three, joined by another three from TF-10. I happily report that the vigor of these plants seems to be good. As yet, the pink doubles bloomed together with var. ‘Plena’ or perhaps even a little earlier. 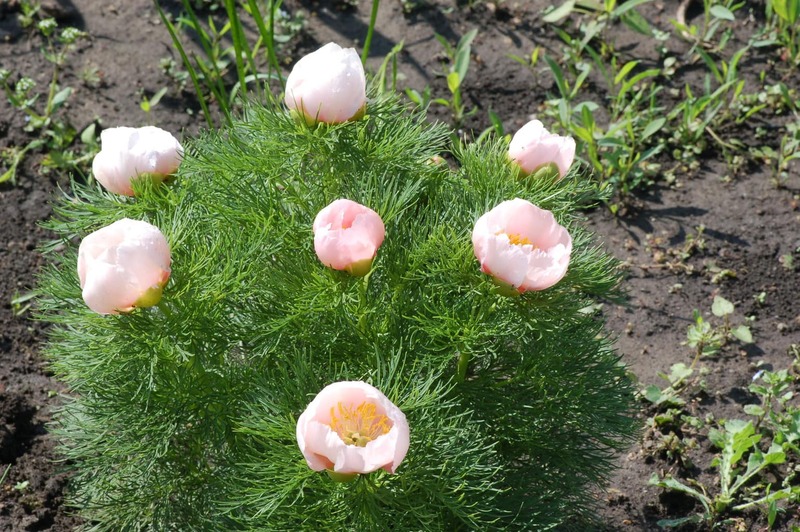 On an average, the flowers of these seedlings are much alike, but there are also differences. TF-8 and TF-10 have flowers roughly as large as var. ‘Plena’ with a color similar to var. ‘Rosea’ while the substance is better. TF-9 has slightly smaller flowers which are a little “feathery“ and the color is more intense. Time will show how constant these traits are and if maybe there are even more differences . The flowers of TF-8 were always bagged to prevent unwanted pollination. TF-8 has been registered as Little Erna. As can be derived from the above, 75 percent of the F2 generation is heterozygous. In other words: genetically different from both the wild form, the var. ‘Plena’, and the var. ‘Rosea’. Hence, one can expect some variation in appearance as well. This proved to be true. Several of the single reds have larger flowers compared to the wild form, sometimes with extra petaloids. Many of the plants are more compact growing than the already known, existing forms. The red doubles slightly vary in size, doubleness and depth of color. Some have flowers which also look ”feathery“, while others carry large, massive globes which can well compete with the var. ‘Plena’. Meanwhile it has become obvious to me that TF-4 is heterozygous of the type ddRp. This seedling blooms a little later than var. 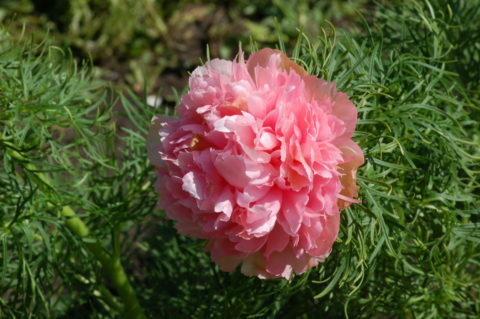 ‘Plena’, the plant habit is slightly more compact and the flower color is somewhat lighter. Some of the pink singles are clearly different from var. ‘Rosea’, especially TF-6 and TF-7. I suspect these plants are most likely heterozygous of the type Sdpp. The petals of the flowers of both TF-6 and TF-7 have a heavier substance than the petals of var. ‘Rosea’. For TF-6, this makes the flower color appear somewhat opaque. This plant is of the dwarf-type and forms an exceptionally nice little bush. The flowers of TF-7 are larger than usual. They look rather massive and have a distinctly deeper color, which is particularly impressive on opening. The shape of the bush is also nice. As it seems, quite a few fine garden plants can be expected from the F2 generation, aside from the pink doubles. Clearly, the present results are very encouraging for further breeding. One promising prospect will be a larger share of pink doubles. While this is 6.25 % in the F2 generation (TF-2 x TF-1), using TF-4 as the seed parent (TF-4 x TF-1) will likely result in doubling this outcome (12.5%). The cross TF-4 x TF-6 will expectedly yield a share of 25% pink doubles. Finally, crossing a pink double with a heterozygous pink single should result in 50% pink doubles with the balance being pink singles. I tried all possible matings with TF-8 through TF-10 as seed parents and TF-6 or TF-7 as pollen parents and got a surprising result: TF-8 and TF-10 completely refused the pollen applied. It is comforting under these circumstances that TF-9 proved fully fertile with both TF-6 and TF-7. 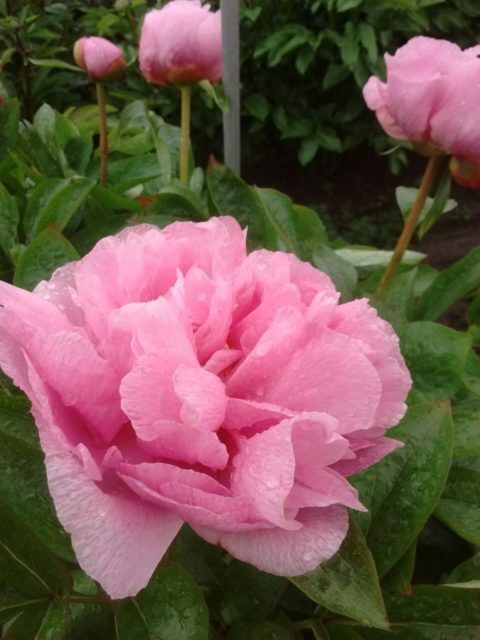 It’s also comforting that all three pink doubles were fertile with Paeonia mlokosewitschii. This might bring new qualities into the tenuifolia-mlokosewitschii hybrids. Meanwhile, I have also made some other crosses, among them backcrosses with the original varieties. Maybe the results of further breeding will exhibit still more variation in color, shape and habit. This can be particularly hoped for from plants with one of the newly found white-flowered forms in the parentage. TF-10, now registered as Aunt Fritzi, bloomed first in 2013. It can be anticipated that in a not too distant future there will be a considerable number of red double, pink single and pink double tenuifolias. How to name all these plants? 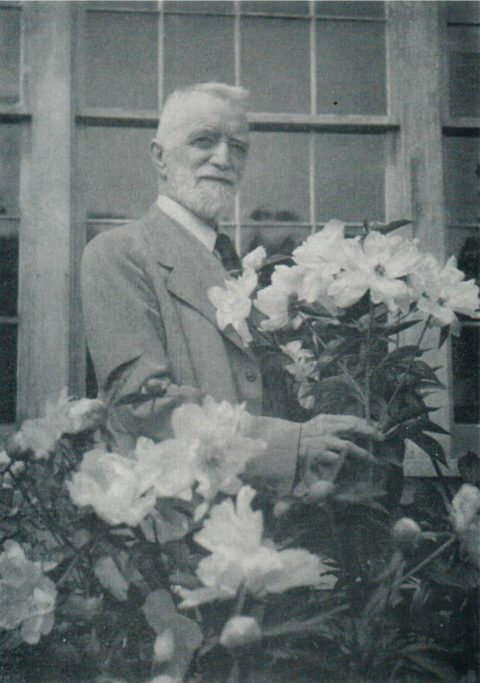 In 1838, when the renowned British botanist David Don described the var. 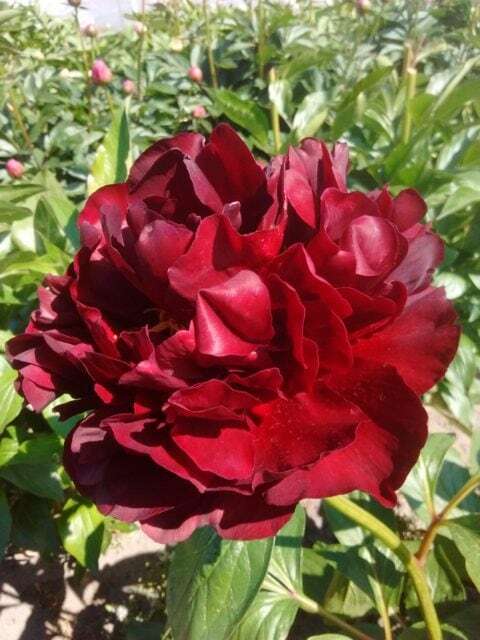 ‘Plena’, it was common practice to rely on Latin cultivar names. This is not allowed anymore. 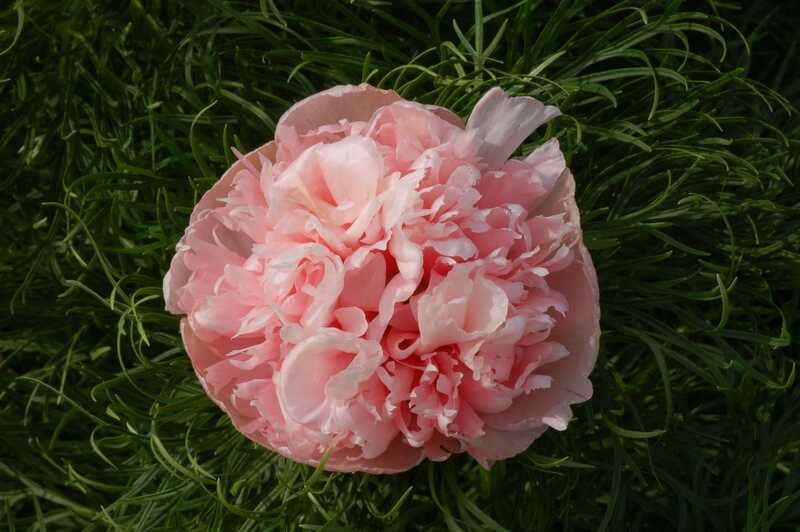 At all events, the best seedlings will get names in accordance with the rules of the International Cultivar Registration Authority (ICRA) for peonies, which is the American Peony Society. What will become of the plants that are not distinctive enough to register and not poor enough to throw away? Considering the rather low multiplication rate of tenuifolia clones, it could be an option to sell them as unnamed seedlings. One can only speculate what will happen in time with the traditional varieties from which all this began. Will they stand their ground and keep their identity, or will they drown in a flood of newcomers? Author’s Note: Thank you to Ruud Warmerdam for his help in writing this article. This is the question that all hybridizers find themselves asking at some point. If I remember correctly, Roy Person would let the public come in and dig up all the seedlings that he was not interested in keeping ! 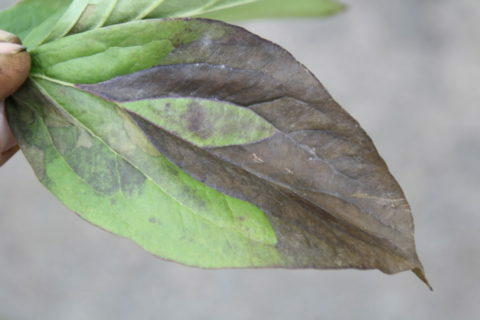 This may not be the best approach, but the question is still a dilemma for hybridizers. My sense is that the best plants for further hybridizing are often not the plants that are most worthy of commercial introduction. Plants for introduction need to be good of course, but sometimes non-introducible plants from the same cross have valuable qualities that the introduced ones might not have, By that I mean good pollen, or the ability to make seeds. Such plants may also have spectacular vigor, or remarkably strong stems. Their flowers may not be remarkable, but they can contain many of the same genetics as the introducable plant has. I know for myself that I have several plants like this. 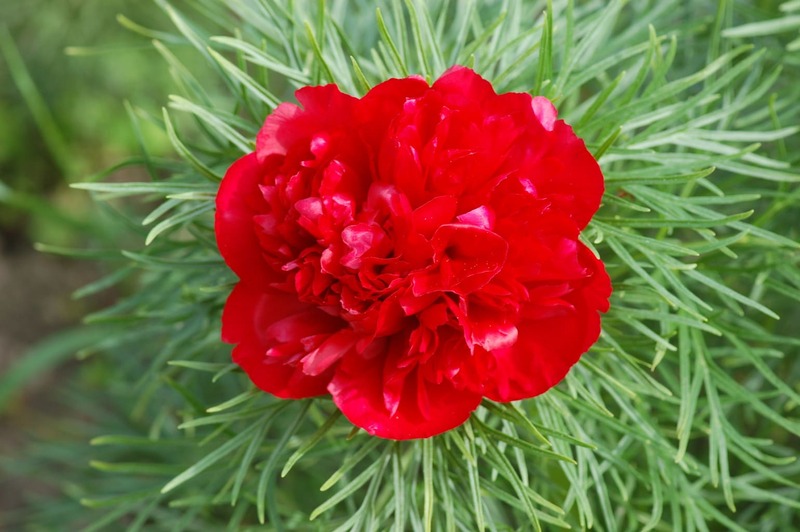 They will never be introduced, but when combined with other varieties through hybridization their value is proven. To see more of Han’s hybridizing results, it’s worth taking a trip to Han’s website. While it’s not in English, he shows us the outcomes of his various crosses, not only with tennifolia, but with other varieties as well, and is something that can give the casual observer an idea of what hybridizers are up against, when they have to evaluate the results of their crosses. Does anyone know when the Double Pink Fernleaf Aunt Fritzi or Little Erna will become available? That may take a while. The article was originally written in 2013 and offers the description of the flowering plants then (which had at the time not yet been named). Those were all plants of which there was only one. Thus suppose they have been divided Fall 2013 and some sent on towards some growers. Then they may or may not have divided again in 2015 and maybe 2017. Suppose three divisions could each time be obtained, then we would now have 27 plants in their first year of growth again (1-3, 3-9, 9-27). This is a best-case-scenario with division every two years (it might also take 3 years), good multiplication rate and in the hypothesis that each and every plant is divided again (thus Hans not keeping any plants for himself or for hybridizing). 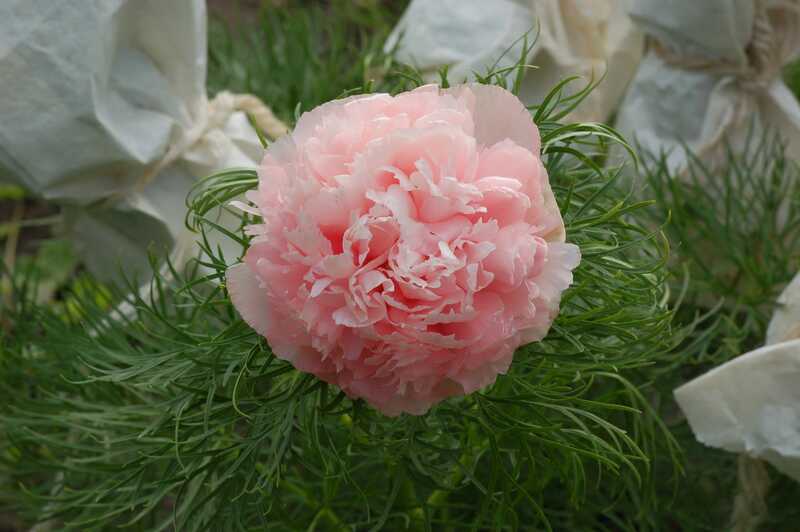 But as Hans would say: “I believe it is known that tenuifolia clones dont multiply as quickly as some other peonies”, thus arguably the number will be smaller. The first years of a new cultivar is simply building up stock, which in the beginning goes very slow, but once you get to the larger numbers, it can go very quick of course. I believe there’s great market potential for these cultivars as they are unknown to most people, completely different, and they offer both spectacular foliage and flowers, thus season-long interest. 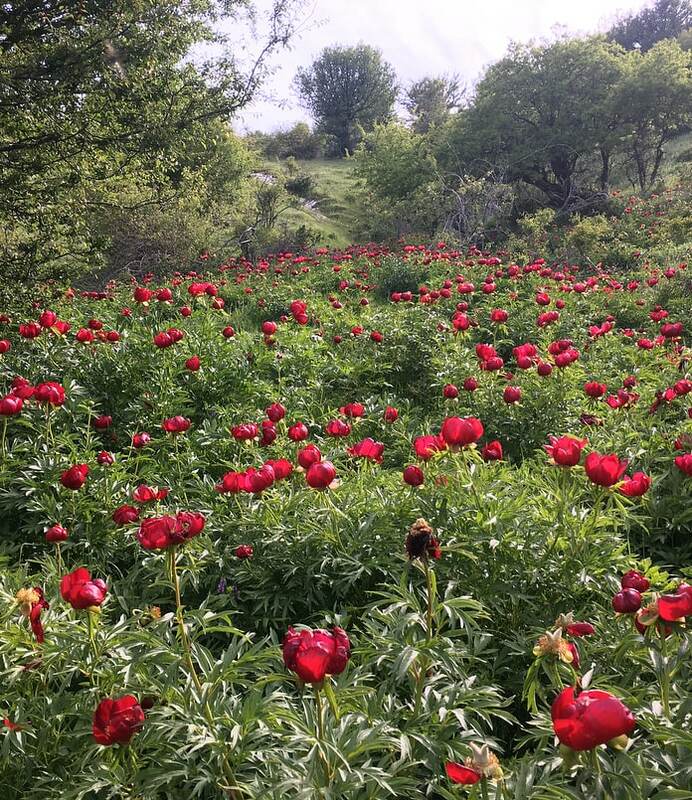 The combination of scarce supply and serious demand (in peonies in general, but such rarities in particular) may result in what I would expect to be very high prices initially.